Azumi Hotel definitely set a high standard in providing quality accommodation on affordable rate. Because of your busy life, most often than not, your body craves for relaxation. However, due to your tight schedule, you just opt to stay at home, thinking that traveling is going to tire you even more. But isn’t it rewarding if you’re able to go out sometimes and discover a place to unwind. The answer to your dilemma is STAYCATION! 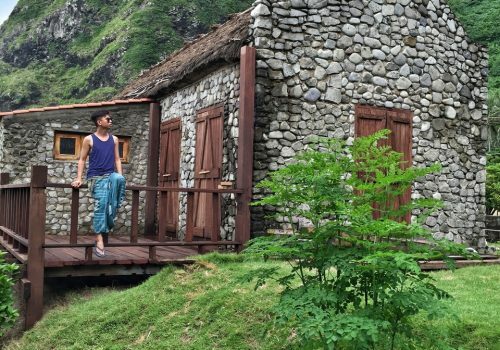 In this time and age, you don’t really need to go far to experience a dream vacation. 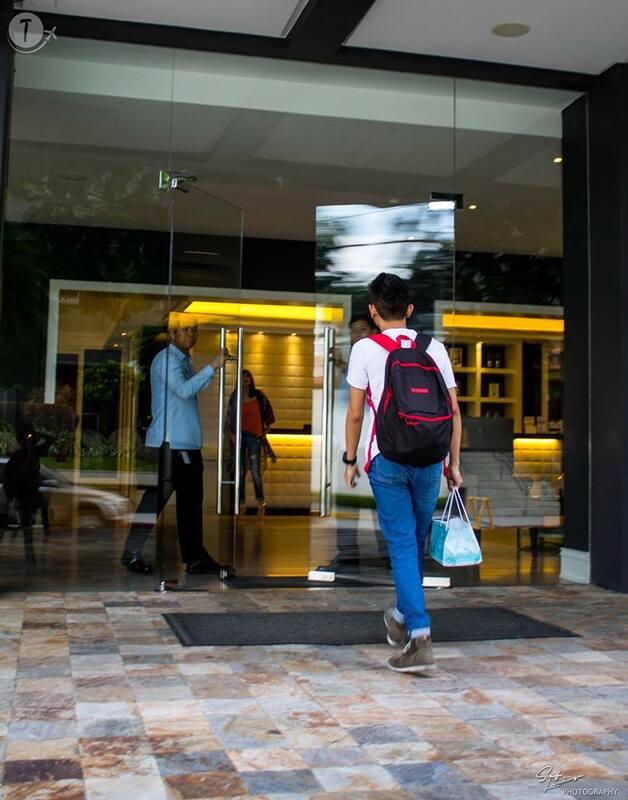 Located at Madrigal Business Park in Alabang, Muntinlupa, approximately, less than an hour away from Makati and NAIA, why not spend a vacation close to home at Azumi Hotel? 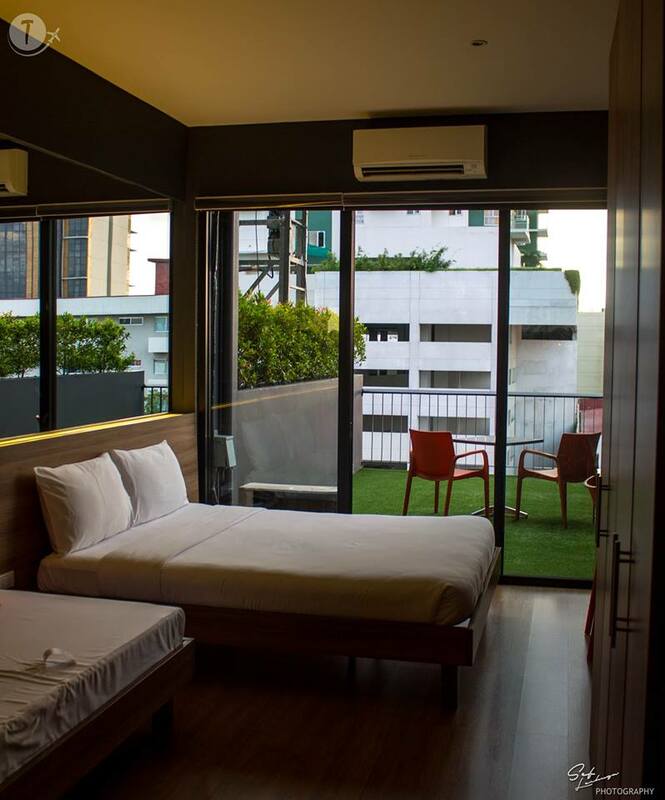 Recently, I had a wonderful opportunity to have a relaxing staycation at Azumi Boutique Hotel. 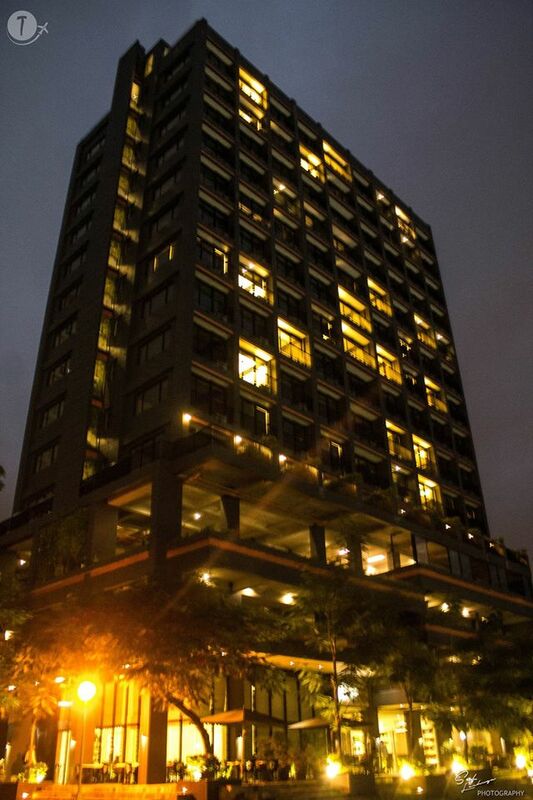 It has a contemporary vibe going on that made me choose it over any other hotels. The size isn’t too big or small so it isn’t intimidating. Every corner of this hotel has a personality that makes it stand out from all the rest. Their decorations are bizarre and appealing to the eyes. 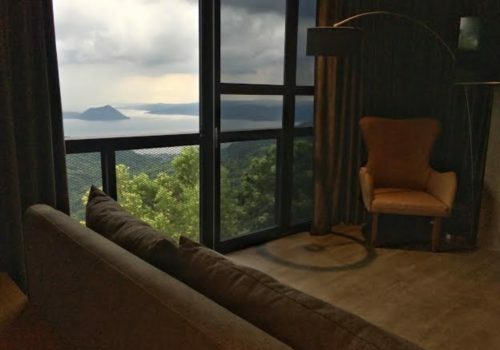 It is situated at the heart of Alabang and in close proximity to different business establishments and malls, yet during my brief stay, I was able to have that much-needed rest. 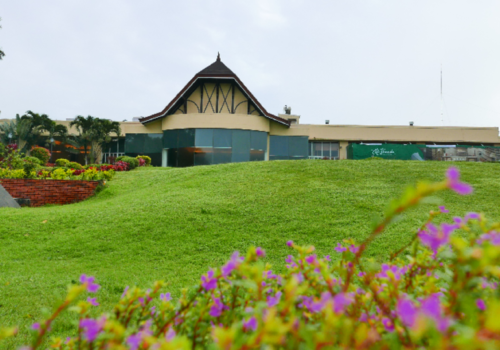 It sits in a prime location, right in the heart of Alabang! As someone living in the northern part of Metro Manila, I had the notion that Alabang is far. I realized it isn’t so, especially when the traffic flow is okay. When I went there, the traffic situation in EDSA is moderate but my travel time from Ortigas was just less than an hour. And I did this through public transportation. How to get to Azumi Boutique hotel? Take a bus with the “Alabang” route in EDSA. Drop off at the South Terminal and take a jeep that passes via Zapote Road. 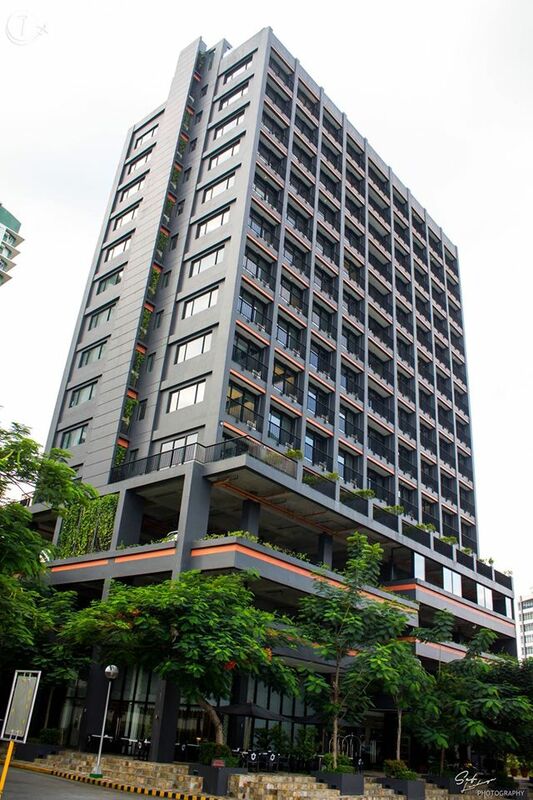 Drop off at Madrigal Business Park (Market St.) and from there, you will instantly notice the stunning Black Building of Azumi Hotel. 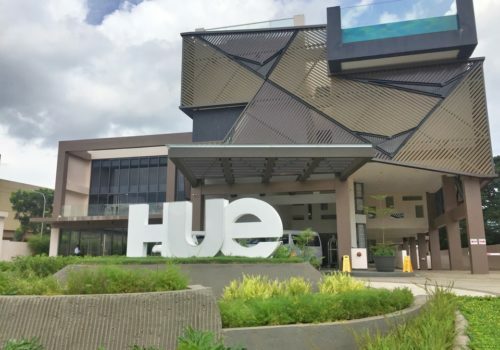 The hotel’s location is accessible, in fact, it is near some malls, such as Molito Mall and Alabang Town Center.Despite being in a city though, the surrounding of this hotel is calm and peaceful. 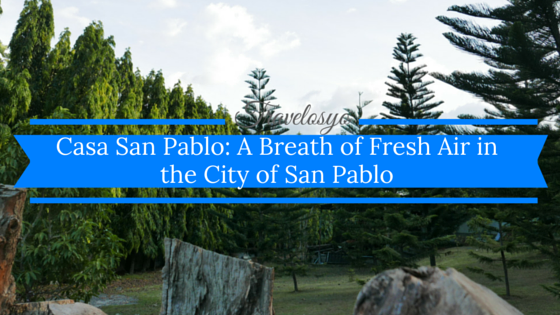 Absolutely, an oasis to de-stress and take a breath in the city. It has a stunning lobby! As they say, “ the first impression lasts,” so I truly believe that hotels and other establishments for that matter should have a nice looking lobby. In this part, Azumi hotel didn’t disappoint me. Within moments of entering the hotel, I instantly fell in love with its modern ambiance. Also, despite being in an area with many people, I love the fact that the lobby is clean. 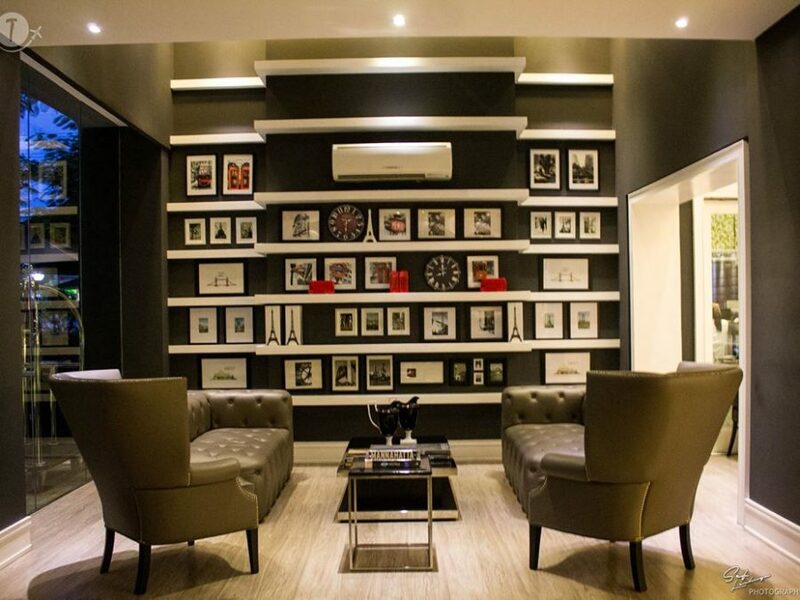 I’m impressed with its style and decors, the color combination of white, black, and gray complements the lightning, giving the reception area a sophisticated feel. Not just an ordinary lobby where people check in and check out, it is designed in such a way that would encourage guests to socialize with one another. 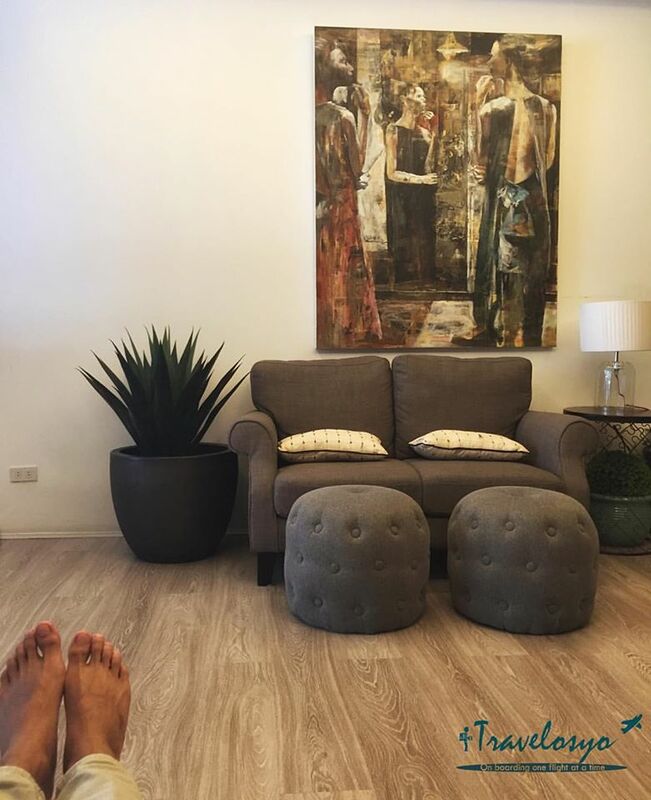 The Nail Spa and Romulo Cafe are also conveniently connected to the lobby. It has a chic and modern garden room! The first thing I consistently check in a hotel’s room is the restroom. This automatically influences my opinion whether the room is excellent or not and based on what I saw in my room, Azumi has passed the test. The bathroom of my room has a very inviting aroma that would make your bathing experience much more relaxing and enjoyable. The rainfall shower is also a nice touch. Moreover, it has a glass that offers a view of the sky. 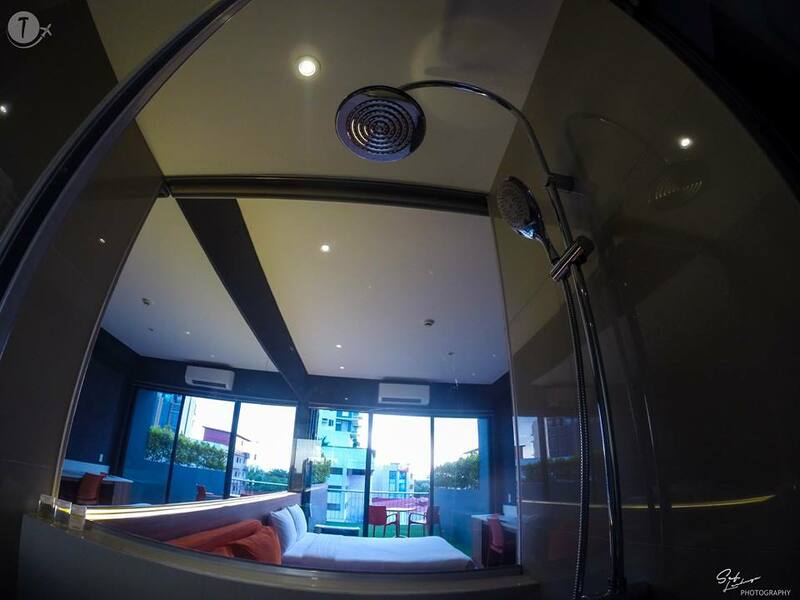 The 47sqm garden room is air-conditioned, has a mini kitchen, refrigerator, microwave oven, and water heater. There is also a spacious cabinet with a safe deposit box and LED TV. The bed, bedding, and pillows are amazingly comfortable that I had a hard time leaving the bed in the morning. Guests can also use their free WiFi. Every guest are given their own username and password to use the Wi-fi connection. The main room is divided by a glass door connecting to the balcony. A perfect spot for drinking coffee while watching the sunrise, an ideal place for reading or writing. Undoubtedly, my experience in this room is extraordinary! 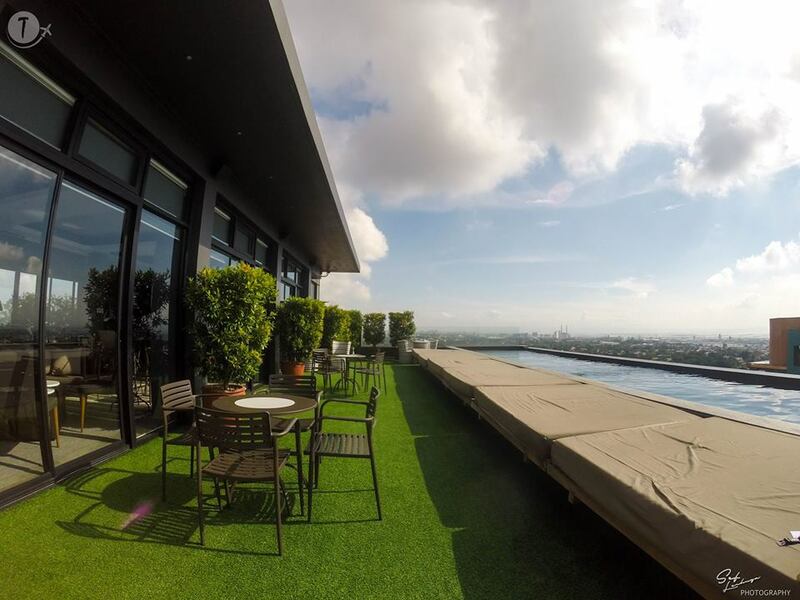 It has an astonishing view of the city skyline from the infinity pool! Who doesn’t love infinity swimming pools? Well, Azumi has one. This is one of the things that got me excited actually because I have always been fascinated with infinity pools. I was not disappointed, not only the swimming pool is beautiful, it also has an astonishing view of Alabang. 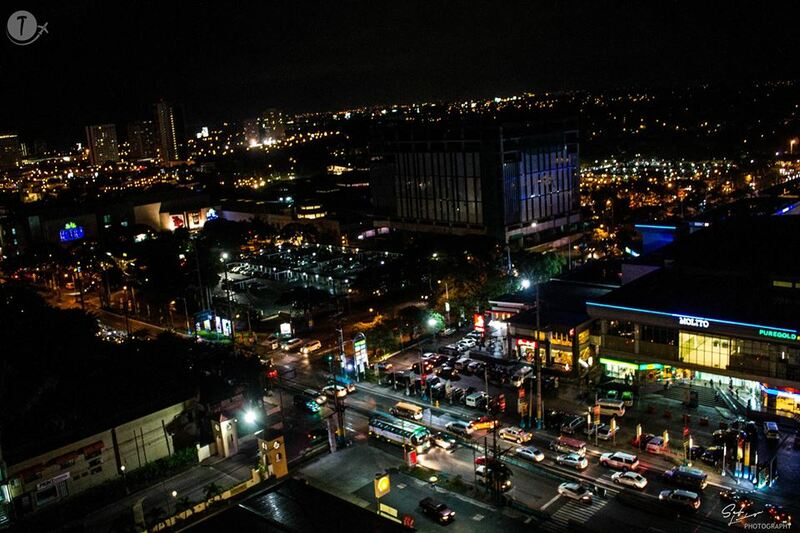 It’s best to visit the area during night time to see the vibrant skyline of Alabang. The water is warm, fit for swimming both day and night. The lounge near the pool area is an exquisite place to drink and socialize with your friends. 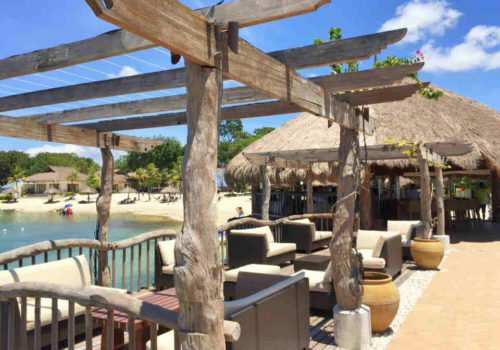 You also have the option to drink in their lounge bed just beside their infinity pool. What an awesome way to celebrate life with your friends or better half while enjoying the view of the city and sky! Romulo Cafe’s food is delightful! 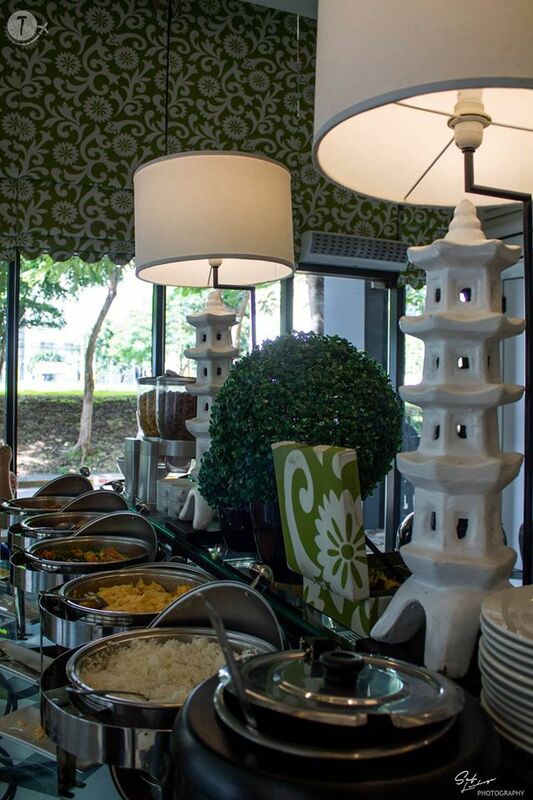 Azumi hotel also houses a restaurant that serves great-tasting Filipino food with a twist. 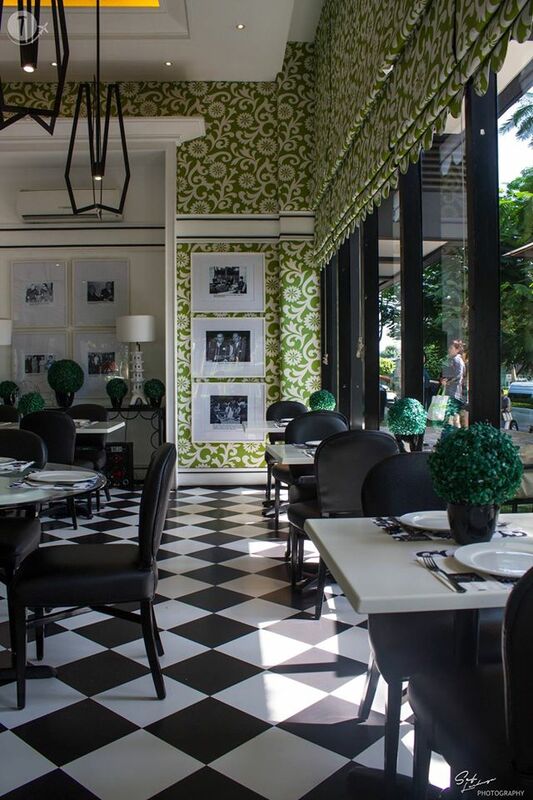 Before I share how delicious the food served by Romulo Café, I would like to commend the designer of this restaurant. Good job for making every spot of this restaurant picturesque. I mean, how can you not enjoy your food with this kind of view? I had Tinapa roll for appetizer; I didn’t know you can make a great lumpia from tinapa. The Chicken-Pork Adobo Romulo style offers a new way in eating adobo, the sauce was separated from the meat. I found that I love it this way. Bagnet Pakbet is my top favorite. I love that instead of an ordinary cooked meat mixed with vegetables, they topped it with Bagnet. It’s awesome! Also, the food that was served for breakfast was luscious. A good way to start my day! Do feels like heaven, who will not be tempted to eat with this kind of presentation? Before leaving the hotel, I decided to have some foot massage and pedicure. After half an hour of a very ticklish foot massage (because I’m not used to getting foot massage that’s why) I literally didn’t want to move and just wanted to sleep on the comfortable couch. Seriously, the place is so stylish and relaxing, an upgraded version of the usual nail spa. My nails deserve a good treat too! Friendly and efficient staff means outstanding customer service! From the moment I entered the hotel, I was greeted with warmth by all the staff. From the lobby guards, Maria, the PR officer ofAzumi hotel, to the front desk team. I was feeling really shy and exhausted because I came all the way from Rizal but they made me feel at ease. I observed the staff as I walked around the hotel’s facilities. The front desk team is very accommodating and always wear a smile. I even received a call from them, asking if everything was okay and if I needed anything. 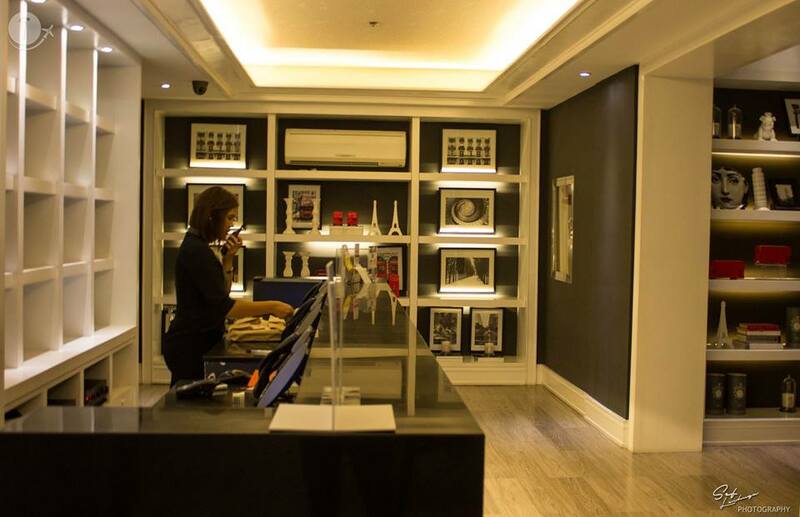 The staff from both Romulo Café and Nail Spa, on the other hand, are very polite. I couldn’t thank them enough for their wonderful and excellent customer service. Azumi Hotel is Located at 2205 Market Street Madrigal Business Park Phase III Alabang, Muntinlupa Philippines, 1780. For discounted rate please click this link. Note: This is a sponsored hotel stay with Azumi Boutique Hotel. All views, posts, and opinions shared here are my own. Yehey! You will love it trisha. Welcome back! I love staycations! You get to explore your own back yard. It’s amazing what you find! Me too. Sometimes you don’t need to go far to discover something awesome. well, you’ve convinced me. When I’m back in Manila, I’m staying here! 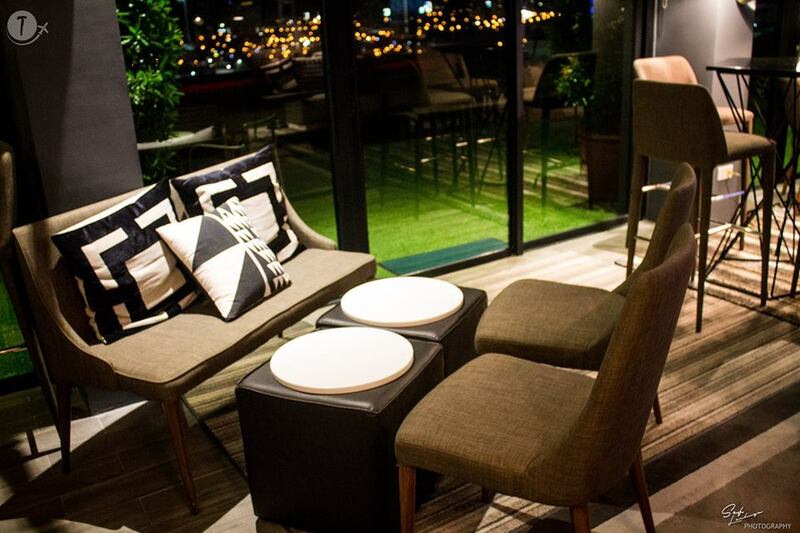 I love a boutique hotel, the ‘grass’ is a cute touch on the balcony! 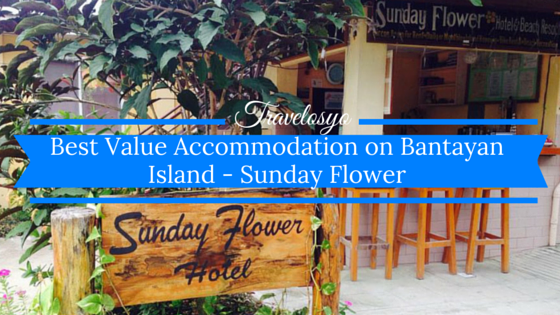 Boutique hotel is the best alternative to 5 stars hotel. Affordable yet the service is amazing! Staycation is a good idea! Since I left the Philippines 8 years ago a lot of hotel and luxury hotels popped up everywhere! So true, indeed sometimes body craves for relaxation and you want to plunge into luxury. This property looks awesome. A nice review and good photographs. I wouldn’t mind spending there a couple of days… I love hotels! Ang sosyal naman sa Azumi. Cai I like your nakatalikod pic entrance to the hotel, yung kunwari di mo alam na kukunana ka ng pic. Like Marge I’m sad I didn’t win. haha! But yes, infinity pools are really something else. I would like to try one even though I don’t know how to swim. Hope I can stay soon in Azumi 🙂 Thanks for the tips! Looking forward to see you here soon! Hindi naman yan lagpas tao. Hahaha hindi ka malulunod ? Wow, I love LOVE to stay there just for that gorgeous infinity pool! looking forward to see you at Azumi Hotel. Oh yes! they have a lovely pool! Nothing wrong with a staycation! This hotel looks great, I wouldn’t mind staying a night here. Nothing wrong with a staycation 🙂 This hotel looks great by the way. I wouldn’t mind staying the night here. 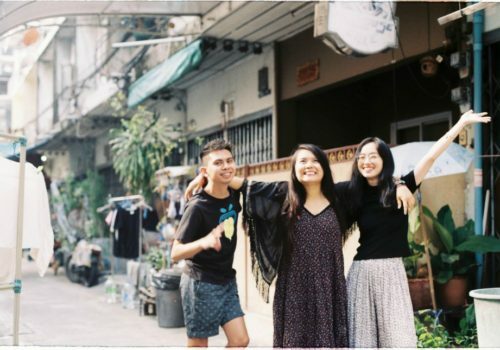 Great photos! I am a little jealous…lol I need to travel more! There will be upcoming giveaways Sis. Keep on joining!